Remember my best friend, Max? Before his baby sister, Sarah, and My Baby Sister, Lulu, were born, he and Mommy and Michele and I went out to lunch ALL the time. We’d hit Music for Aardvarks or story time and then go for a nosh. We have a few favorite spots; Panera, Harry’s Burritos, and the Art Cafe all offer yummy food in mostly toddler friendly environs… well, there was that one time Mommy and I left the Art Cafe in a hurry, but we’ve been back since and that really wasn’t SUCH a big deal. Sugi Steakhouse is *right* near the library and they have a super-affordable yummy lunch menu – AND they have a little koi pond in the front. Mommy loves the 2 maki meal, which comes with miso soup and salad with the most delicious ginger dressing. *I* like the shrimp shumai and edamame – and my friend, the waiter! Max and Sarah were sick this week, so when Mommy finally wrangled me and Lulu out of the house and to the library, we were on our own for lunch. Sugi tends to be fairly empty during the day time, and Mommy figured that if I became… difficult, she could have her food wrapped up to go, so after some time in the children’s room and a nice chat with the librarian, Lulu and Mommy and I went for a lunch date. Mommy’s first attempt dining alone with two of us! My friend the waiter greeted me by name and I immediately asked him if I could feed the fish – Mommy said after I ate. Sometimes he makes me an origami crane – or even a boat to float with the fish! This time, he made me a pair of training chopsticks and showed me how to use them. 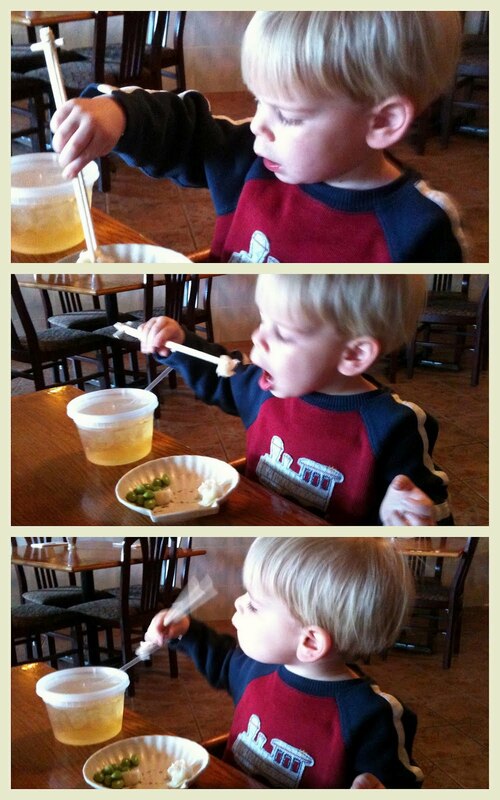 When I finished my dumplings, he came and got me and helped me feed the fish while Mommy finished her sushi. How nice is that? For any of my Rockland peeps, you should totally check out Sugi – it’s on 202 in the Shop Rite shopping center. It’s not just for toddlers, either – Mommy and Daddy used to go there for date night back before I was born… you know, when things like date night involved actually leaving the house. They have hibachi, too, in case you’re not all about sushi – but you should check out the volcano roll if you DO like sushi because? Yum. Sugi totally didn’t pay me to post this – I’m pretty sure they don’t know I have a blog – but they are always SUPER nice to me and we really do like to eat there so I wanted to share for any of my local friends. Oh my gosh, that sounds like a super fun place! And what a great waiter! !